Bethesda Softworks announced in February 2014 that anyone who pre-ordered Wolfenstein: The New Order would receive beta access to the next Doom game when it reached that stage. 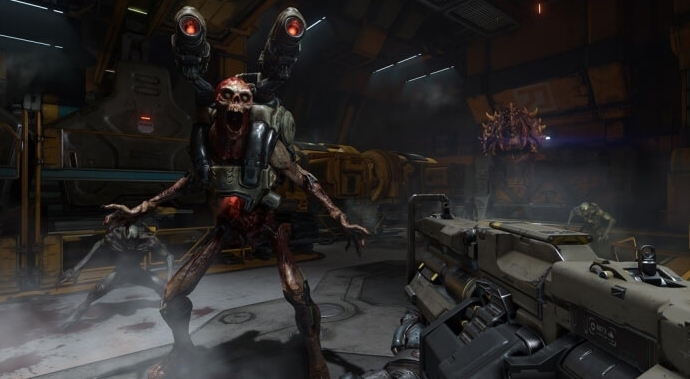 Using Doom to boost sales of Wolfenstein was no doubt a slick marketing move and now, the publisher is preparing to make good on its pre-order promise. First things first – those that pre-ordered Wolfenstein should have received a code at that time for the Doom beta. With that in hand, you’ll want to head over to the Doom website to redeem it. It’s worth noting that your beta code doesn’t guarantee access to this alpha although there’s a pretty good chance you’ll make it in considering Bethesda wants to stress test the game’s dedicated servers in a simulated real-world consumer environment. Those that do make the closed alpha will have access to a 6v6 team deathmatch that’ll play out on a single multiplayer map. Heatwave is described as an industrial-themed map with narrow corridors, walkways and small chambers that link up to a central open area. The map is said to be stocked with plenty of armor, ammo and health pickups and should accommodate multiple play styles. Players will have access to six weapons (vortex rifle, super shotgun, repeater, rocket launcher, static cannon and plasma rifle), two equipment items (personal teleporter and frag grenade) and one power weapon (gauss cannon). Bethesda hasn’t yet issued a start date for the alpha although I suspect prospective players won’t have to wait too much longer. Yeah it looks good. I hope it has a proper single player campaign worth playing otherwise Bethesda won't be seeing any of my money. I'm pretty sure it will, else it wouldn't really be DOOM. Yes I agree with a single player campaign.... Also would like to see good support for VR headsets and motion accessories. I dunno so much. Remember back in the days when COD used to have a great single player experience, whatever happened to that? it still does, though it' shard to make a great story after so many stories have been done already. The novelty is gone. THey have to be creative. they promised action and half of the video I am watching a scripted video sequence waiting it to finish. stupid and self purposed level design with shiny floors. no hell, just another space station. if it had not the name doom nobody would tell "hey, it is like the old doom, but better"
Anyone else get a an alpha multiplayer test invite for this friday... I did... oh yes!